SELECT AN OPTION FOR QNIQUE LASER STYLUS For The Q'nique 15R, 15M, 14+ Brother DQLT, and Block Rocket 15" Arm Machines or For The Longer Arm Q'nique 21 Machine. Please Answer the Question in the menu above on this page. Thanks. 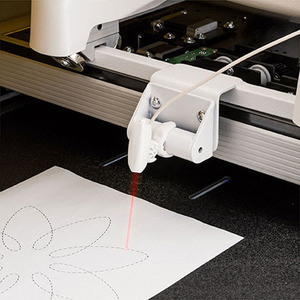 The Qnique Laser Stylus is the easiest way to trace patterns or photographs while quilting on a machine quilting frame. Just attach the laser stylus to the Qnique Quilting Machine, and position it to trace the desired pattern so you can follow along! The laser can be attached to the front or rear handles, or even on the bottom of the machine, between the wheels. The easiest way to trace patterns when quilting is with the Qnique Laser Stylus. Just place a paper pattern off to the side and follow along with the precise laser indicator. Even copy patterns you've already quilted without a paper template! The Laser stylus plugs right into the Qnique’s accessory ports, so there are no batteries to buy or replace. 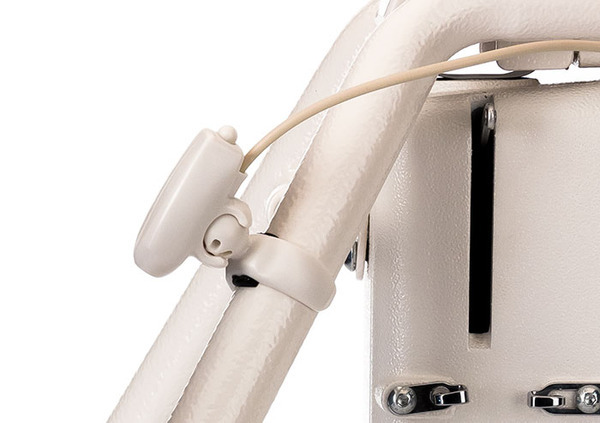 The laser is designed for maximum versatility and can be attached to the front or rear handles, or near the bottom of the quilting machine, between the wheels, with the included adapter. Once attached, the laser can be rotated or positioned in any angle. Q'nique Laser Stylus For Precision Pattern Tracing The Q'nique Laser Stylus is the easiest way to trace patterns or photographs while quilting on a machine quilting frame. Simply attach the laser stylus to the Q'nique Quilting Machine, position to trace the desired pattern and follow along! The laser can be attached to the front or rear handles or on the bottom of the machine, between the wheels. QNIQUE LASER STYLUS mounted on front handles. Excellent customer service. I had entered an incorrect address and when I notified customer service they provided great quality service that is not shown often to ensure I received the product.